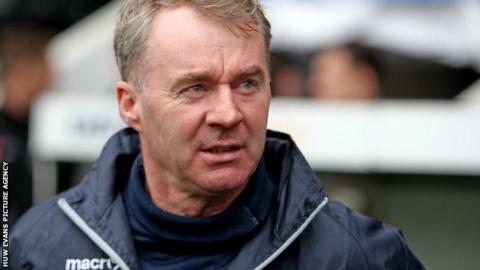 Newport County manager John Sheridan has not ruled out staying with the League Two club beyond this season. Former Republic of Ireland international Sheridan was appointed in October until the end of the season. Sheridan has transformed County's fortunes since his arrival but is purely focussed on keeping the club in the Football League. ''My mindset is just that I have come in to try and do a job, which is to keep them in the League," he said. "I think the time will come when I need to sit down. Former Plymouth Argyle boss Sheridan, who is still based in Leeds, succeeded Terry Butcher and was brought in to the club to rescue the club this season. He has steered County from bottom spot to 20th in League Two, with a seven point cushion from the relegation zone. ''I am very happy here, I am really enjoying it," the ex-Leeds United and Sheffield Wednesday midfielder added. "The players are giving me everything I am asking for and I think we are a half decent team at the moment. ''I just want to improve us and try and get us higher in the table." Newport are at Barnet on Boxing Day before hosting Sheridan's former club Argyle two days later. Sheridan is looking to secure extended loans for five players who have figured during the club's recent run of good form. Aston Villa's Janoi Donacien, Swansea City striker Oliver McBurnie, Cardiff City duo Tommy O'Sullivan and Jazzi Barnum-Bobb and Notts County defender Scott Bennett, are all coming to the end of their loans. ''Most of it will be done next seek. I am asking the question whether we can keep the loans and the respective clubs will hopefully agree. If w can keep them it will all be good," Sheridan said.